Registration is a straight-forward procedure. After downloading and installing the app from App Store, just proceed with our greetings screen and enter your phone number in the last screen. This is number will be used to identify you as a user and later will be referred as “home” or “main” number. 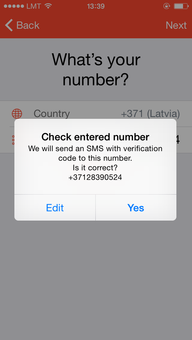 An SMS will be sent to this number with 4-digit code which will be used to validate you. 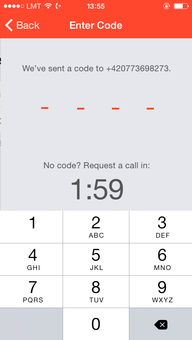 If SMS doesn’t come, then you can request the code via callback (corresponding button will be shown after 2 minutes). 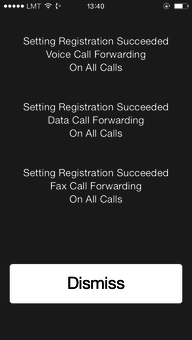 After finishing registration you are set to make and receive cheap international calls! 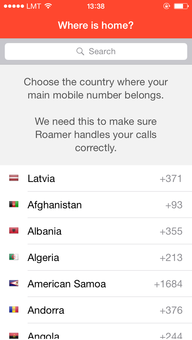 To allow Roamer handle your incoming calls, you should turn on “Receive calls when abroad”. To do this, you will need to setup forwarding to our local service number. An instruction screen will be presented to you. 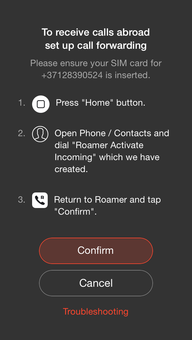 Here you will need to close Roamer (press Home button) and make a call to “Roamer Activate Incoming” contact.This contact gets his number assigned dynamically when you tap on “Receive calls when abroad”. If you pass 1-2 steps and proceed straight forward to step 3, you will see that “Roamer Activate Incoming” is empty. Open Roamer again and tap on "Confirm" button to finish the process. 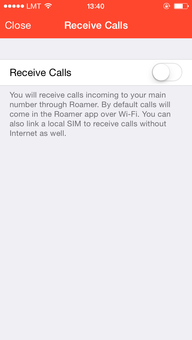 After activating “Receive calls”, all calls will be handled by Roamer. 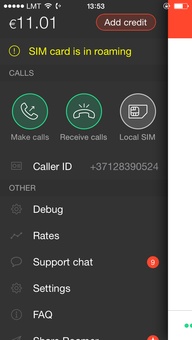 Incoming calls over internet are free! 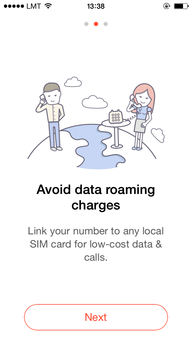 Linking local SIM is not mandatory, since you can use Wi-Fi hotspots to receive and make calls, you must keep in mind that sometimes there are no available Wi-Fi connections nearby, or public Wi-Fi networks has a bad latency, or VoIP traffic get’s blocked. Economy - buying local SIM may save you your money if you’re going to stay for while in abroad country and allow you to be fully connected with your family, friends and coworkers. Reliability - local SIMs usually provide 3G/4G internet access. This eliminates several problems which may occur by using public Wi-Fi hotspots (closed ports, high latency, blocked VoIP traffic and etc). In addition to that, you will be able to make regular calls that uses GSM/CDMA cellular networks. 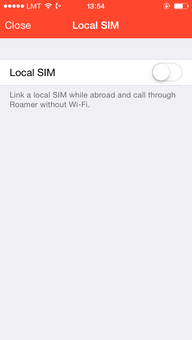 Keep in mind that you can link local SIM only abroad. 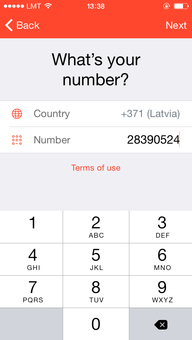 Linking local SIM in home country could trigger unwanted roaming charges. 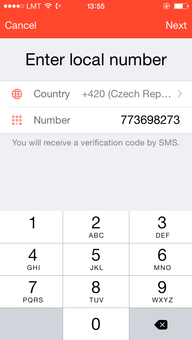 If SMS doesn’t come, then you can request the code via callback (corresponding button will be shown after 2 minutes). 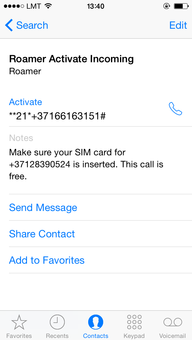 • Free calls (Wi-Fi/3G/4G) - those are actually Internet calls between Roamer users. You don't pay anything! Both users need to have their numbers registered in Roamer and both have to have Internet coverage on the moment of call. 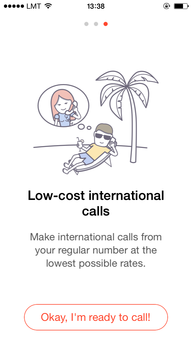 • Internet calls (Wi-Fi/3G/4G) - cheaper, since users don't need to pay for the callback call and only requires the Internet connection. 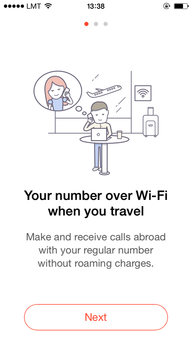 • Regular (GSM) calls - more reliable, since there is no need to have a constant internet connection. Connection is only required to initiate a callback (couple of KBs of data). Even if you don't have an Internet connection - don't worry! Roamer will use a smart call-through system and will initiate a call in a different way - without the internet (takes more time). 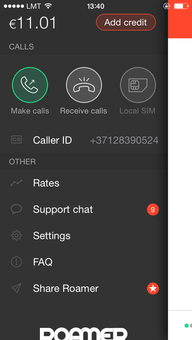 To select the type of call simply navigate to our dial pad tab (rightmost one) and use the switch or choose a contact from your contact book (there will be a button for each type of call). 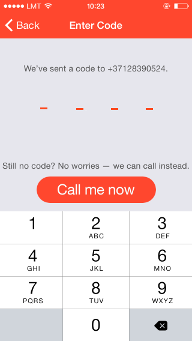 In addition to that, our users are free to set change their caller ID as they like. Three caller IDs are available for you to choice: your home number, your local number and “hidden” number. 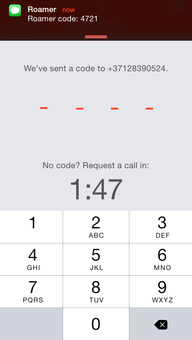 Local number caller ID is available to you only after linking local SIM.